Kofi A. Amoako was born and raised in Ghana, however he has spent the last decade and a half in Toronto, Canada - mainly as a student and and as a youth engagement worker. He's working to complete his International Development studies degree. He enjoys humour, soccer and all the other simple things in between. I've been writing for about 10 years now - though not focused enough or consistently enough for my own liking. I enjoy the poetry of Amiri Baraka, Gabriel Okara, Maya Angelou, Chinua Achebe, Leopold Senghor, and Ernest Hemingway is wonderful as well. I also love the poetry in old high-life songs - they are simply brilliant. I just want to share some of my ideas or perspectives on all sorts of topics and happenings. But on a personal level, it is a way of reflecting on certain experiences and realities (whether first-hand or of others). It is also a way of relating to other people who may or may not have an understanding of the images that the poem is attempting to paint. It's a way of providing commentary on day to day activities, event, memories, imagined worlds, etc. 4. You note in your bio that you are now living in Canada (hence the poem being about "memories"). When were you last in Ghana. Do you have plans to return soon? Memories are important to living and Ghana is a memorable place. 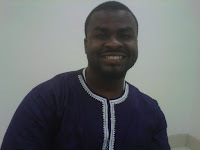 Luckily, I have gotten the opportunity to go to Ghana on two occasions in the last two years. I was there for five months from May-October 2011 on an internship. And yes, I plan on returning soon (I've begun the long process of saving all the pennies that I come across). 5. How do you think living in Canada for the last decade and a half has shaped your writing? Do you think yo would be writing more or less the same things, in the same style, if you still lived in Ghana? Living in Canada has definitely influenced me because I have spent over half of my life here. Being an immigrant definitely allows one to have a clearer understanding and/or appreciation of both the life experiences in the old country and in the new country. So for instance, I am much appreciative of my Ghanaian upbringing as a result of being in Canada. Similarly, I am thankful for my Canadian experience because it has allowed me to grow in many ways. So surely, my writing wouldn't be the same if I still lived in Ghana because the lens with which I engage the world would not be the same. A person's perspective is shaped by many factors and for migrating people, location plays a critical role in forming that perspective. I love this poem! What an insight into life in Ghana. I will be visiting soon and I hope the power is on and off when needed! Thank you Jabulani. as you know, power outages (with its good and bad) have become part of everyday living in many places. Beautifully written poem. Simplistic in the demand for efficient and more reliable/dependable methods of electricity; your writing reminds me of our privilege here in Canada. Somehow those instances would never be deemed the "norm" nor acceptable. Thank you for the realness from which you write. It's as though you've shared an important piece of yourself with me. Thank you.